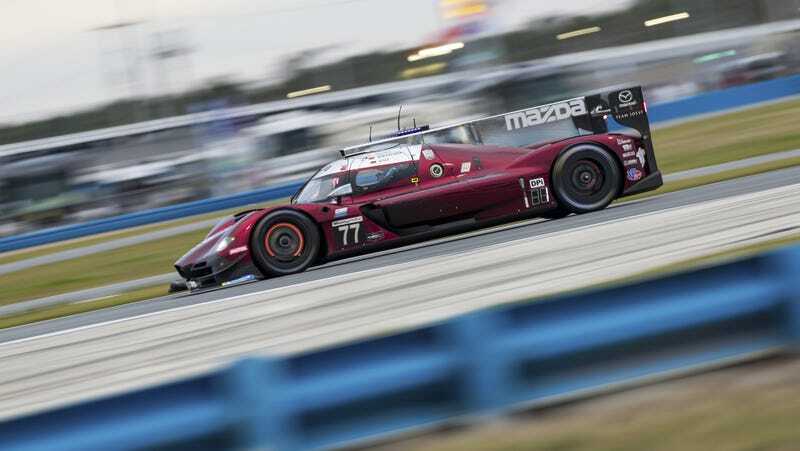 9:10PM to 9:20PM Eastern have not been a kind ten minutes to the Mazda team at Daytona. Both cars suffered failures, and are both back in the garages where the team will try to repair both at the same time. First, the #55 car had an ignition failure at speed crossing the start finish line. Olivier Pla was onboard at the time and was able to re-cycle the ignition to get the car all the way around the circuit and back to the garages. This ended up being a fuel leak that sidelined the car. The team managed to fix this, and the car is back out 3 laps down now. Just a handful of minutes later, the #77 car was fighting for top positions with Porsche factory driver Timo Bernhard at the wheel had a huge spout of flames come out of the back of the car. After a few minutes of slow burn, Bernhard managed to get the fire supression system to work. According to the race broadcast, 22 team members tried to get the car back together, but it was all for naught. The car has officially retired. It is unclear if both cars suffered the same failure, but it’s clear the #77 got the worst of it. Both cars sure were fast, and I was definitely pulling for the #77, but hey at least my predictions are already wrong.